‘Purple Disco Day’ builds just as a Purple Disco Machine afternoon festival set would, the deep tones of Paul Alexander’s voice and deconstructed funk of Forrrce ‘Keep On Dubbin’ (With No Commercial Interruptions) making way for the sounds of Yuksek & Bertrand Burgalat’s ‘Icare’ from 2018. A trio of classics brings up the tempo, followed by more newness from Horse Meat Disco direct from the Glitterbox stable, Dele Sosimi ‘You No Fit Touch Am (Medlar Remix)’ and the first brand new edit from the man himself, Ilija Rudman featuring Andre Espeut ‘In Her Eyes (Purple Disco Machine Edit)’. The edit, which has taken pride of place in his sets for a while now, and finds him at his deepest, leading into a Kenny Dope mix of the Boris Dlugosch collaboration ‘Love For Days’ featuring Karen Harding. 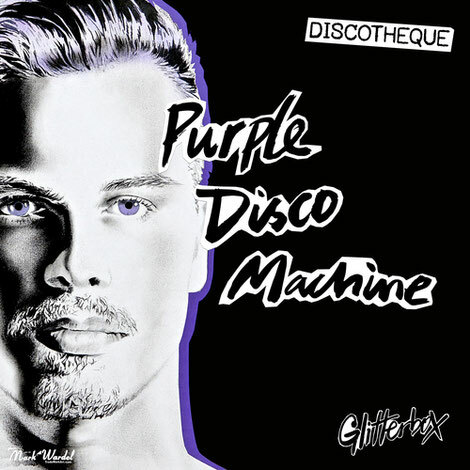 On the flip, ‘Purple Disco Night’ starts strong with two huge remixes from Purple Disco Machine himself, Shakedown’s ‘At Night’ and Weiss ‘Feel My Needs’. The tunes keep coming; Mighty Mouse’s ‘The Spirit’ providing the energy and Moloko’s ‘Sing It Back (Mousse T.’s Feel Love Mix)’ providing a singalong moment. His second exclusive edit is of Julien Jabre’s ‘Swimming Places’, a Defected classic from 2005 with so much emotion, brought tactfully into 2019 with a fleshed-out bassline. Documenting the full might of his production credibility, no mix would be complete without his remix of ‘Praise You’ by Fatboy Slim and of course the crossover hit ‘Dished (Male Stripper)’.